Our research investigates two major aspects of bacterial growth in their natural environments: 1) the biology of their growth on surfaces as biofilm communities; and 2) the interactions of bacteria in mixed (polymicrobial) populations. In addition, we have also examined the contribution of bacterial cell surface structures and biofilms to bind metal ions and form minerals. While the tendency of marine bacteria to attach to surfaces has been described by Claude Zobell and other microbiologists in the early 20th century, only recently has the importance of this mode of growth become evident. The term biofilm was first introduced by Bob’s PhD advisor, JW (Bill) Costerton, in 1981 to describe microbial fouling in industrial pipelines. Biofilms occur in many environments, typically at liquid-solid interfaces or in some cases, liquid-air interfaces. In medical environments, biofilms are associated with chronic infections, and medical device infections. 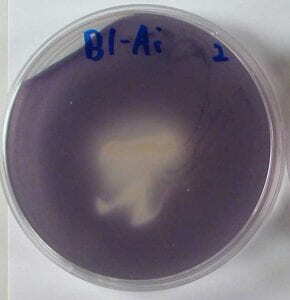 Tooth decay (dental caries) and gum disease (periodontitis) are other examples of biofilm-associated infections. 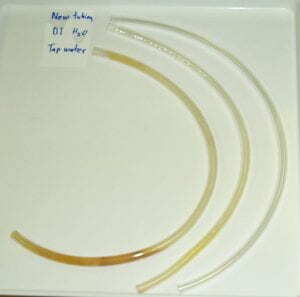 The figure to the left shows discoloration due to biofilm formation after several months on TygonTM laboratory tubing attached to tap water and deionized water. A control piece of tubing is also shown. Growth in biofilms allows bacteria and other microorganisms to become highly tolerant to most antibiotics and disinfectants. Click here to learn more about the importance of biofilms. 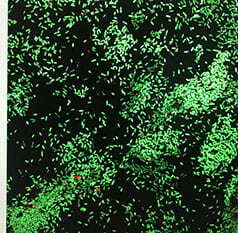 Previous biofilm work in the McLean lab: Bacteria within biofilms live in high-population-density clumps, referred to as microcolonies (individual bacteria fluoresce green and red in this micrograph). The dark areas surrounding the microcolonies are referred to as water channels and provide a mechanism for organisms within microcolonies to gain access to nutrients and oxygen. With the assistance of some outstanding collaborators, graduate and undergrad students, we were the first group to show that N-acylated homoserine lactones (AHLs), associated with quorum signaling, were produced by naturally occurring biofilms in aquatic and medically relevant environments. We also showed that genes for rpoS (associated with slow growth), and the stringent response genes, (relA and spoT (associated with starvation), were needed for growth of Escherichia coli biofilms. We also identified a gene, bsmA, that influences E. coli biofilm formation and stress responses. 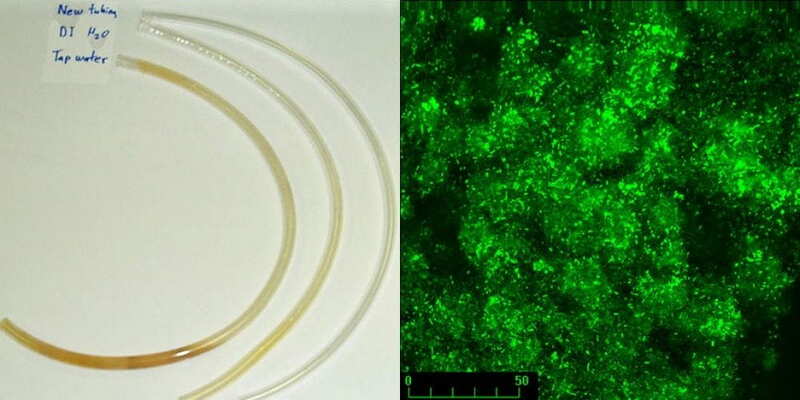 While biofilms have been described in most environments on Earth, we were the first to show that biofilms could form under microgravity conditions encountered during spaceflight. Quorum Signaling and Biofilms: Bob and his lab were first introduced to bacterial group behavior (quorum signaling) by Clay Fuqua. Quorum signaling has been shown by several investigators, to be critical for biofilm formation. In 1996, Givskov et al showed that furanones produced by the marine macroalga, Delisea pulchra, could prevent biofilm formation via inhibition of quorum signaling. Since pigmentation in some bacteria (e.g. Chromobacterium violaceum (shown here) and Pseudomonas chlororaphis) is regulated by quorum signaling, we adapted a bioassay whereby the quorum inhibition potential of different compounds and organisms could be detected on the basis of a loss of pigmentation (as seen in the center of this figure due to interference from another organism). Among other things we have detected quorum inhibition by some food additives and heavy metals. We also performed a field study to investigate whether metabolites from quorum signal-producing bacteria could attract other bacterial species into biofilms. While there was some indication of quorum signal attraction, the major finding was that one or more compounds in spent media may influence subsequent colonization by other bacteria. Polymicrobial interactions: Since the pioneering work of Louis Pasteur and Robert Koch, most microbiology investigations have employed pure cultures. However, microorganisms typically live in mixed populations, and so we started investigating polymicrobial interactions beginning in the late 1990’s and particularly since 2007. While we have mostly focused on bacteria in these investigations, there have also been some studies in which viruses have also been investigated. In mixed culture work with aquifer isolates, we showed that the presence of an organism, resistant to betadine (iodine compound) disinfection, could convey resistance to iodine-susceptible organisms within a biofilm. Using a variety of genetic and biochemical analyses, we observed that indole production by E. coli allowed this organism to compete with Pseudomonas aeruginosa by inhibiting AHL-based quorum signaling in P. aeruginosa. We also observed that indole could inhibit AHL-based quorum signaling in three other gram-negative, AHL-producing, pigmented organisms including C. violaceum. The numbers in the figure indicate indole concentration (mM) and “mix” represents the reduced pigmentation seen during C. violaceum co-culture with E. coli (indole concentration was 0.40mM). While indole does help E. coli compete with AHL-producing Gram-negative bacteria, it does not help competition with Gram-positive Enterococcus faecalis. Geomicrobiology Work: While a graduate student, Bob explored the ability of Proteus mirabilis biofilms to cause a type of kidney stone containing the mineral, struvite (magnesium ammonium phosphate – see link for review article). During his postdoc with Terry Beveridge, he was introduced to geomicrobiology and explored the ability of bacterial capsule polymers (slime) to bind metals. During his first academic position at Queen’s University, Bob collaborated extensively with Dr. Curtis Nickel (Urology); Diane Beauchemin (Chemistry); Lynann Clapham (Physics); and Heather Jamieson (Geology). His lab continued work on the role of P mirabilis slime and biofilm growth on struvite formation, and also explored the role of dehydrated biofilms on nesquehonite mineral formation. After his move to Texas State, Bob explored other aspects of biomineralization. One interesting finding was the observation that biofilms forming on leaves, can promote mineral formation and fossilization. He also worked with two geologists at the University of Texas, Robert Folk and Brenda Kirkland, to investigate the role of nanobacteria (also spelled nannobacteria – small bacteria-shaped objects that are much smaller (10-100nm diameter) than regular bacteria (typically ≥300nm diameter). Included in these studies were laboratory and field investigations including a field trip to the Le Zitelle hotsprings in Viterbo Italy (shown on the home page of this website). Microgravity influence on biofilms: In collaboration with Mark Ott (NASA-JSC) and Cheryl Nickerson (Arizona State University), we are currently investigating the formation of polymicrobial E. coli and Pseudomonas aeruginosa biofilms and their susceptibility to disinfection under microgravity conditions. In a related project, we are also investigating the ability of some aquatic isolates to grow and form suspended biofilms (bacterial flocs) under modeled microgravity. Signaling and biofilms: We are planning to reexamine the influence of quorum signals on biofilm population recruitment using a metagenomics approach. In other studies, we are investigating the effect of altered culture conditions on quorum inhibition, biofilm formation, and biofilm dispersion. Influence of nano-sized objects on mineralization: When first observed, nanobacteria were thought to be small, independent life forms. While that interpretation has been questioned by some scientists; an alternative explanation is that nanobacteria may be fragments of bacteria and other microorganisms. We are testing this idea using struvite as a model mineral formation system.